Quality, durability and promising performance are the aspects for which our UPVC Pipe Fittings are immensely demanded in the worldwide markets. 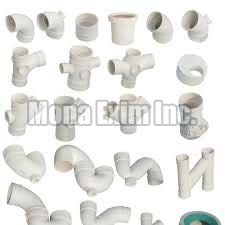 We share space with the premier Manufacturers, Suppliers and Exporters of the UPVC Pipe Fittings from Mumbai, India. Provided in diversity of specifications, these UPVC Pipe Fittings are quality assured by thorough screening on crucial parameters. Besides that, the prices quoted by us are nominal.